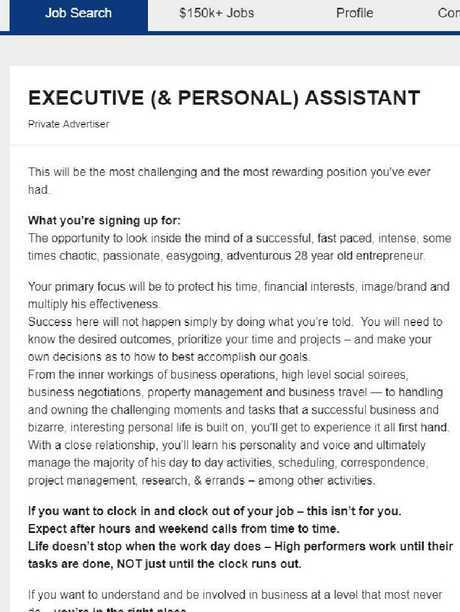 A ridiculous ad for a part time executive assistant position has been posted on Seek. Behold the most self-indulgent job listing of all time. A 28-year-old company head posted a vacancy on job search site Seek, detailing a part-time personal assistant position at his company, which has gone viral. The ad details the many personal and professional criteria, including never being able to clock off, extensive job duties ranging from content creation to cleaning and property management, and "a desire to lead from behind". "This will be the most challenging and the most rewarding position you've ever had," the ad begins. It goes on to describe the position as an "opportunity to look inside the mind of a successful, fast-paced, intense, some times chaotic, passionate, easygoing, adventurous 28-year-old entrepreneur". "If you want to clock in and clock out of your job - this isn't for you," the listing continues. "Expect after hours and weekend calls from time to time. Life doesn't stop when the work day does - high performers work until their tasks are done, NOT just until the clock runs out." 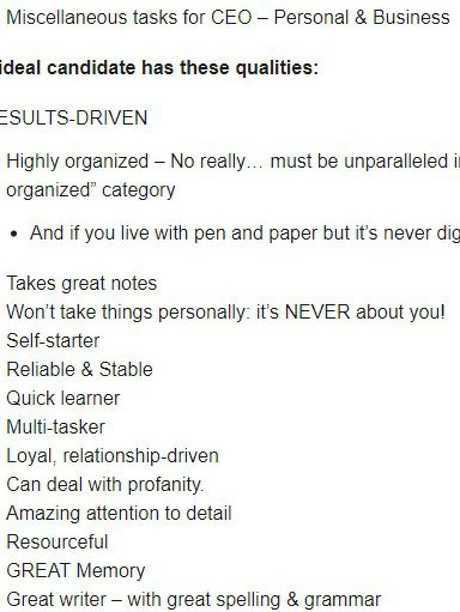 The boss writes about the need to keep up with his "activities and type A personality", which he admits "isn't for everyone". The ideal candidate should also be able to not "take things personally: it's NEVER about you!" It also details that the applicant must be willing to put up with "profanity". 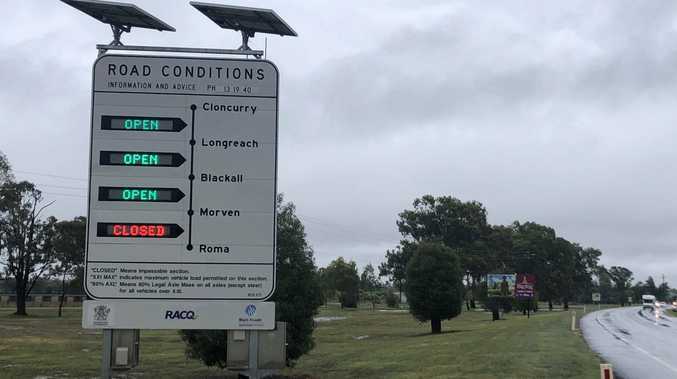 The CEO said the part time position is not open to candidates who want to clock in and clock out, and they should expect calls on the weekend and after hours. A ridiculous job listing detailing the endless demands of a CEO has been posted on Seek. The pay for the part-time position starts at $50,000. It is unclear whether the CEO plans to include overtime for the phone calls and extra hours worked, or if this would be a salaried position. "Success here will not happen simply by doing what you're told," the listing reads. "You will need to know the desired outcomes, prioritise your time and projects - and make your own decisions as to how to best accomplish our goals. "From the inner workings of business operations, high level social soirees, business negotiations, property management and business travel - to handling and owning the challenging moments and tasks that a successful business and bizarre, interesting personal life is built on, you'll get to experience it all first hand. With a close relationship, you'll learn his personality and voice and ultimately manage the majority of his day to day activities, scheduling, correspondence, project management, research, & errands - among other activities." The CEO goes on to detail other things that expected from his executive (& personal!) assistant. You will need to be "INCREDIBLY organised, intellectual, honesty, have integrity, tech savvy" and able to help "Maintain Alignment in the CEO's life." You will be held personally responsible for "Making the CEO look good, feel good and perform at a higher level". You'll be in charge of "miscellaneous tasks" from "coffee to contract execution" as well as organising events, travelling to events and orchestrating the rest of the team's travel to these events. You'll be writing articles, you'll be creating digital assets, you'll be looking after the CEO's properties and you'll be cleaning the office and maintaining office supplies. You will "understand and be involved at the business at a level most never do." Jokes aside, all this might have one wondering what exactly the CEO is doing, given it sounds like the part-time personal assistant might wind up doing a lot of the heavy lifting. It sounds like the role of a CEO by another name, just without the salary. If you'd like to apply, the advertised position is on Seek.